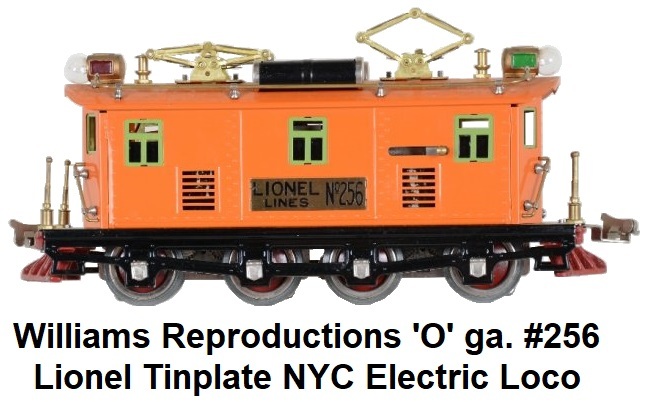 Founded in 1971 by Jerry Williams (1937 - 2016) in Columbia, MD, as a maker of reproduction Lionel and Ives 'O' and Standard gauge trains, originally produced in the 1920's & 1930's. At the outset the company was called Williams Reproductions Limited. All reproduction trains were made of steel, using the same gauge as the originals. Items were manufactured in limited runs, and some came in a solid redwood custom made box with special engraving on the ends and top. Most of the locomotives and cars came in unpainted 'Repli-Kits' or fully painted in colors that matched the originals. The company also offered restoration parts. Jerry Williams had come from Classic Model Corp., another Maryland based maker of Standard gauge trains. Around 1975 Williams began to shift attention to the 'O' gauge post-war era market, first with kits and then with completed models. In the mid to late 1980's, Jerry explored making scale-size locomotives for 3-rail track. In 2007, Williams Reproductions Limited was sold to Bachmann Industries, where the train line today is known as Williams by Bachmann. Jerry Williams's interest in electric trains dated back to his boyhood years. In the mid to late 1960's his interest was renewed and he spent much of his time visiting estate and yard sales to look for collectable Lionel and Ives trains. He soon recognized that many desireable models were nearly impossible to find in like-new condition, with most being in need of repair or restoration. Jerry felt that there might be a market for new trains similar to those made in the pre-World War II years. He first started building and selling toy trains in 1969 in partnership with Fred Mill. Trading as Classic Models Corp., Fred and Jerry built a quality line of old style Standard gauge tinplate trains of original design. Jerry felt that prospects would be better if he produced accurate reproductions of the desireable pre-war era trains instead. Fred preferred to continue to build the Classic Models style of products and the two parted ways. In December of 1971 Jerry Williams established Williams Reproductions Limited as a Maryland Corporation. Jerry chose the Ives 'O' gauge #1694 4-4-4 electric locomotive from 1932 as his new company's first project. This locomotive is one of the rarest 'O' gauge tinplate models ever made, so its rarity and distinctive appearance established an instant market. Williams began by borrowing a repainted original #1694 to disassemble and duplicate. The reproduction turned out to be a very close replica of the original. The most conspicuous difference being that the replica had a separate cab roof, while the original's roof was integral with the cab sides. This alteration made it easier and economical to facilitate painting the sheet metal parts. The reproduction #1694 was introduced at the TCA's 1972 convention and was well received. All parts, with the exception of cast headlights, wheels and machine screws, were custom made for Williams Reproductions from hardened tool steel dies. Because the replica looked so much like the original, TCA officers asked Jerry to label his product in some way to indicate that it was actually a reproduction. As a result, some of the Williams Reproductions #1694's are marked with a hand stamped letter 'R' near the center of the underside of the floor, while others are not. All units were sold with a decorative display track with an appropriately labeled plaque. These models were not powered, but had dummy motor frames that were ready to accept a motor from a Lionel #262 or similar locomotive. A slot in the roof was provided to facilitate installation of a hand reverse lever. There were 300 pieces made and sold in the 1972 production run. During later production, a set of matching passenger cars were produced, and these were packaged as sets. The cars included were the #1695 pullman, #1696 baggage and #1697 observation. Standard gauge production at Williams Reproductions Limited was called the Golden Memories Series and took place between the years 1973 to 1983. 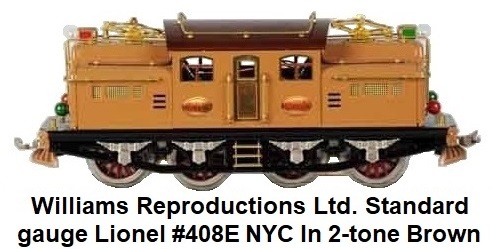 In 1973 Williams Reproductions Limited released a Lionel #9E electric locomotive. The original Lionel #9E was not considered to be rare, but it was expensive. The challenge was to create an excellent reproduction of the #9E at a price which would attract collectors. Original tooling costs estimates were discouraging but Jerry decided to take the chance and his decision turned out to be a sound one. He again borrowed a repainted late style #9 and also an early high-roof version and used these originals as the prototypes for modeling. A few #1694 parts were reused and 16 new tools were made to produce the rest of the parts needed. This too came as a dummy unit, ready for installation of a 'Bild-A-Loco' or 'Super' motor. There were 300 units made in 2-tone green. When about half were sold Jerry decided to build high roof versions as well. 200 of these were produced, half of them in orange and the others in dark green. These were followed by another run of 50 gunmetal-gray units. These were nickel trimmed with black wheels as opposed to earlier production which was brass trimmed with red painted wheels. The first 300 were sold with wooden display stands. Another production run of 300 more #9's in multiple colors followed to satisfy a continuing strong demand. In addition, 100 units were sold in kit form, the first kits issued by Williams. Because Williams sold their Standard gauge Lionel reproduction locomotives as dummy units (without motors) they are sometimes mis-identified as being manufactured by McCoy, since the maker's mark for McCoy appears on the bottom of their motor units, and those motors were frequently installed in the Williams reproduction non-powered locos. The Williams reproductions are easily identified by the letters 'WRL' appearing on the wheels of the unpowered units or stamped on the larger metal parts. Wheels for the #9's were supplied by both McCoy and by Model Engineering Works. These wheels are not interchangeable, and required their own axles. With the success of the #9 locomotive, Jerry Williams knew he had found a market for quality reproductions. He then decided what his next project would be. 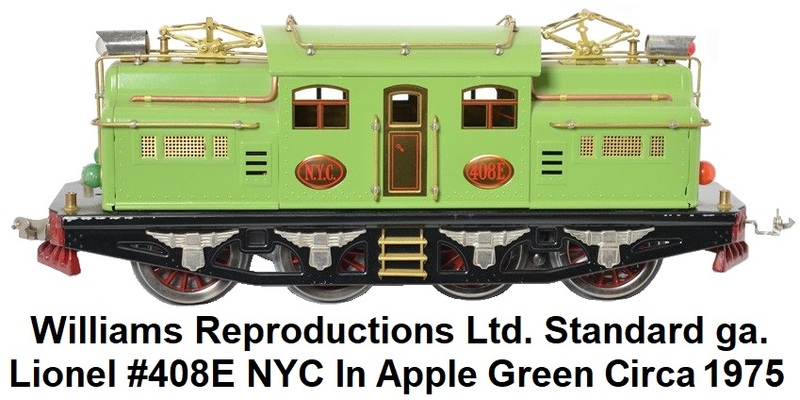 Williams would begin fabrication of a reproduction version of one of the most desireable Standard gauge electric locomotives ever made, and originally catalogued by Lionel trains from 1928 to 1936, the #381E. However, the preparation needed for gearing up the tooling and dies would take some time to complete. Jerry wanted to maintain product momentum and wanted to produce an offering in the interim that had a short lead time. In 1974 Williams Reproductions released a Lionel #94 High Tension Electric Transmission Tower accessory. There was some risk involved as Jerry knew that reproduction trains would sell but he did not know if a reproduction accessory could do well. Initial production was limited as the towers started out as slow sellers. But interest picked up, and all of the 500 units produced eventually sold. The towers were reproduced in red and silver colors with nylon insulators (the original Lionel towers had ceramic insulators). All towers were offered for sale completely assembled. This time Jerry used a tower from his own collection as a the necessary model for creating the parts. A second production run was made in 1981. The #381E locomotive turned out to be a key product for Williams. Tooling costs required a higher selling price and on the basis of strong apparent demand, production numbers were doubled. It was offered as a non-powered dummy unit, ready for a 'Bild-A-Loco' or 'Super' motor to be installed. The company also offered a replacement 'Super' electric motor for sale. There were three separate production runs of the #381E locomotive - first in 1973, then another in 1976, and a final run in 1980. Around 500 of the Williams #381E's were adorned with the typical Lionel nameplate. However, in 1976 Lionel requested that Williams no longer use their branding, and the remainder of the #381E's (roughly 400) were badged with a 'Chicago, Milwaukee, St. Paul & Pacific' set of plates. The same set of suppliers were used to produce the parts for the #381E, however, many new parts were needed which required 32 new dies. 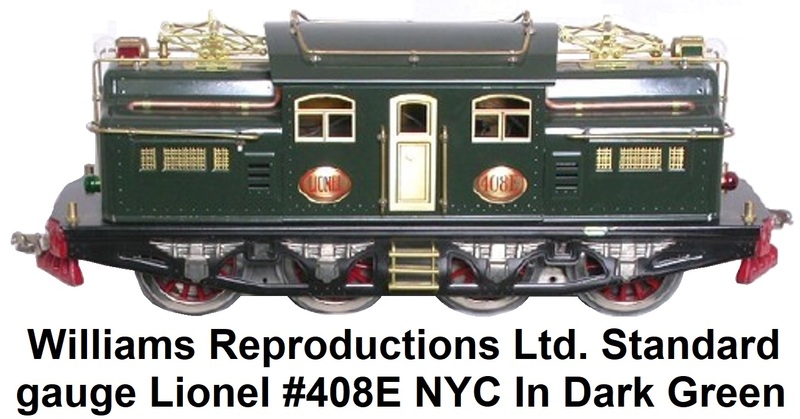 There were no significant structural differences between the original Lionel #381E and the Williams reproductions. The Williams version was not soldered however, and the larger parts were stamped 'WRL'. The first 300 units were sold with wooden display stands. All 900 locomotives were sold fully assembled, but with most trim parts to be added by the purchaser. In 1975 a reproduction Lionel Standard gauge #8 'Pay As You Enter' trolley (originally catalogued by Lionel from 1910 to 1915) with power truck and operating headlight was released. This was the largest trolley that Lionel had ever manufactured. Williams produced 200 and they were first offered for sale at the TCA Convention. The Lionel originals were soldered together, but the reproductions were assembled by tabs and slots that wre carefully positioned to be inconspicuous. The #8 came in a attractive redwood box, without the usual display track. All #8's were painted in olive green and cream colors. 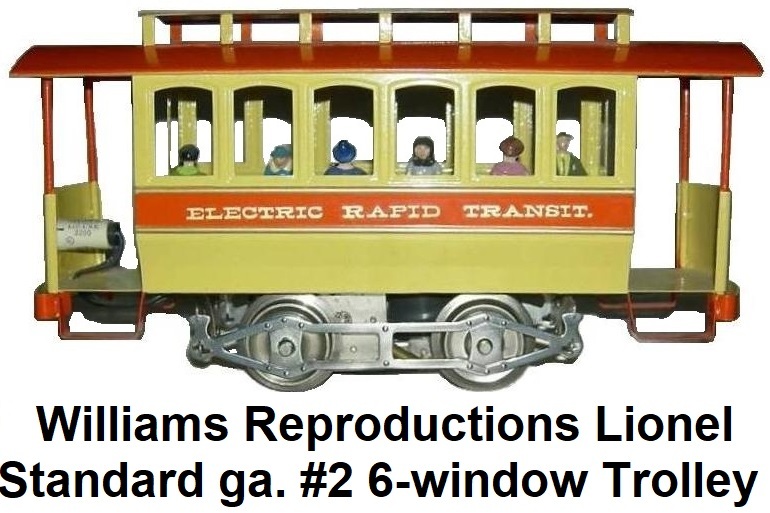 Jerry Williams also produced a Standard gauge reproduction Lionel #2 Electric Rapid Transit 6-window Trolley originally offered from 1914-16. To power his trolleys, Jerry Williams developed his own Standard gauge under floor power truck, which was a self-contained unit employing a small DC can motor and chain drive mechanism using sprocket gears to drive the wheels. The power unit wheel-set also had its own roller pick-up to collect electricity and drive the motor. The DC motor was connected through 2 diodes to permit reversing and AC operation. These self contained power units became very popular with custom builders of Standard gauge motive units that lacked the space to house a full sized electric motor in the shells. In fall 1975 Williams released a Lionel #408E 8-wheeled electic locomotive (originally catalogued by Lionel as a dual-motored, top of the line engine starting from 1927 up until 1936, when all Standard gauge production was ceased). 300 units were produced with 75 painted in apple green, 75 in 2-tone brown, 75 in mohave, and 75 in dark green and unpainted kits. All #408E's were adorned with NYC nameplates and could accept either style of Standard gauge motors. In 1978 came the matching #400 series passenger cars in 4 or 6 wheel truck versions. Offerings included the #418 Pullman, #419 combine, #428 Pullman, #429 Pullman, #430 observation, #431 diner, and #490 observation. These cars featured removable roofs, interior lighting, hinged doors, detailed interiors and colored transparencies in the window transoms. The observation car had a rear platform with a dome light. 300 sets were offered in either orange, dark green, apple green, or mojave. Another 100 sets were produced as unpainted kits. In celebration of the TCA's 25th anniversary, Williams released a special 3 car set headed by a #408E in silver paint. The included cars were named after the famous manufacturers - with a Harry C. Ives combo car, a J. Lionel Cowan parlor car, and an A.C. Gilbert observation car. A Louis Marx diner car was also made available for this set as an add-on. In 1980 Williams released their much longer Standard gauge tinplate reproduction Lionel state car sets with 6-wheel passenger car trucks. These were available headed by either a #381E or #408E and consisted of the #412 California coach, #413 Colorado coach, #414 Illinois coach and #416 New York observation car. These coaches were superbly finished and came complete with hinged roofs, detailed interiors that included seats, washrooms and interior lighting. They were offered in 2-tone green or 2-tone brown. Finally in 1983, Williams released a Universal Dual Motored Power Unit. A reproduction Lionel 'O' gauge #256 locomotive with unbordered brass plates was created by Williams to satisfy demand from 'golden age' tinplate collectors. 500 units were built from brand new tooling. By the late 1970's Williams was slowly shifting its interest to modern 'O' gauge trains, beginning with the purchase of much of the former Kusan Model Train's dies. Williams issued 'O' gauge 40' box cars, reefers, stock cars, and F units from the Kusan tooling which originally dated back to the 1950's when American Model Toys first created this tooling. Initial items were kits, then completed models were issued. The company eventually started making Post-War 'O' gauge Lionel replicas, starting with the classic GG-1, Madison passenger cars and FM Trainmaster diesel. This marked the beginning of the firm's 'Golden Memory' series. Complete Williams sets were made in the mid 1970's to 1980's including NASA sets and military sets. During the 1980's the demand for scale sized locomotives increased dramatically. In response to this demand, Williams created its Crown Edition Line. These models were nicely detailed handmade brass scale models produced as limited-editions. They started out as very simple models of common steam locomotives. Production mostly took place through a sub-contractor in Seoul, South Korea. Later releases were models built for the first time in 3-rail 'O' gauge including The Pennsylvania RR K-4, NYC Niagara, Norfolk & Western J-Class 611 bulletnose, Union Pacific Big Boy, a Camelback Loco, and the Southern Pacific Cab Forward. Thus Williams became a major distributor for scale-like three rail locomotives and cars. This was the birth of 'Hi-Rail' or scale sized items for 3-rail track. At the same time, Williams was phasing out, and eventually discontinued its tinplate Standard gauge offerings, selling the tooling to the company that later became MTH Electric Trains in 1982. Interestingly, Mike Wolf, the founder of MTH, had began working for Jerry Williams at Williams Reproductions Limited in 1973 as a 12 year old kid. Mike lived in the same Howard County Maryland neighborhood as Jerry. Mike and several of his schoolmates were employed to assemble latch couplers and other parts for the pre-war era reproduction trains in Jerry's basement. Mike continued to work for Jerry throughout his high school and college years, until 1980, when Mike's Train House was started. As the 1980's came to an end and the US economy went into a recession, the demand for expensive scale models declined, and Williams focused on more economical-to-produce diesel models such as F-3's, Geep's and SW1 switchers. From 1990 to 2007, Jerry concentrated on the development of models of diesels, passenger cars and rolling stock and the expansion of the Golden Memories line. In 2000, he indulged himself by making one of his favorite models, the Lionel #671 turbine locomotive first cataloged in the mid-1940�s. Most people discouraged him from making this model since they were common items, but Jerry�s instinct was right again and this model proved to be a success. Although Williams was often considered a maker of reproduction 1950's-era Lionel equipment, Williams' offerings are distinguishable from the Lionel originals because Williams sometimes added details that were not possible using 1950's manufacturing methods. Unlike most other 'O' scale manufacturers, Williams never added electronics such as Trainmaster Command Control or Digital Command System to its locomotives. This decision gained Williams a small but devoted following among those hobbyists who wanted a more "traditional" train layout reminiscent of the 1950's but who also wanted to buy modern equipment. However, this decision also allowed companies such as MTH and K-Line to eclipse Williams in size in spite of being an older company. After 35 years, Jerry Williams decided to retire from the model railroad business. In October 2007, Williams was acquired by Bachmann Industries. Bachmann continued to produce a Williams line of 3-rail 'O' gauge trains, track and accessories. In 2016 Jerry Williams was inducted into the Hobby Manufacturers Association Hall of Fame. Jerry�s vision and competition forced other companies to raise their standards. Additionally, many of today�s train manufacturers have benefited from the experience that they learned while working with Jerry. These include Mike Wolf and Andy Edleman of MTH, Ken Silvestri of Broadway Limited, and Larry Harrington of Bachmann Industries. On November 1, 2016, Jerome (Jerry) M. Williams, founder of Williams Reproductions and a pioneer in creating product for the 3-rail 'hi-rail' market, passed away. Link to Williams Trains by Bachmann Web Site.